Yesterday afternoon we alerted you to an 832-point drop in the DJIA that subsequently led to a rise in precious metals like gold. Equities markets still remain low in early morning trading, keeping gold up around the $1,220 per ounce range. As we mentioned yesterday, even though gold is up around $30 per ounce from a few days ago, it is still priced low and in range. That said, we strongly urge you to take advantage of these low prices, lest the stock market take another plunge and send gold prices higher. For investors looking to get a head start on gold, we now have a limited quantity of low-premium “junk gold” $20 Liberties and $20 Saint-Gaudens for just Spot + 4.5% per coin* on any quantity ordered—and for a limited time only! These beautiful American coins are a highly popular choice among investors looking to own a piece of U.S. history without the higher price tag that rare U.S. coins sometimes carry. If you’re serious about owning gold—and getting it while it’s cheap—you absolutely must act now! 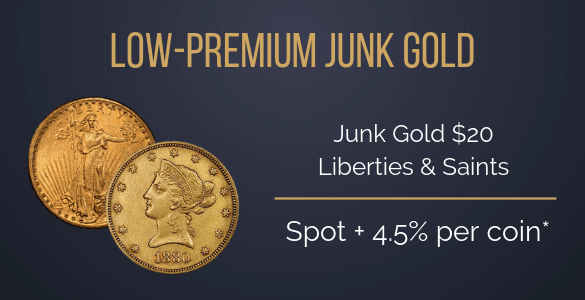 To reserve your low-premium junk gold today, please call us at 800-831-0007 or email us. *Prices subject to change based on market fluctuation and product availability. Prices reflected are for cash, check, or bank wire. Free shipping, handling, and insurance are available for junk gold $20 Liberty and $20 Saint-Gaudens purchases of ten (10) or more. Offer expires Monday, October 15, 2018, or while supplies last.